It seems that iGoBanking.com has awoken with some ridiculously high CD rates that trumps all other rates being offered by other banks. iGoBanking is currently holding the top rates for the 5 year CD category with a 2.25% APY. That’s not all, it also gives competitive rates for other CD term categories. Below are iGoBanking.com’s available rates for different term CDs. 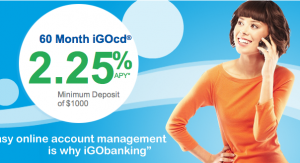 It is surprising how iGoBanking is offering the same rate starting from their 3 month CD all the way to their 18 month CD. Competitive rates only start from their 24 month, or 2 year CD. Right now, their 2 year CD at 1.25% is still lower than the highest nationally available which is from CIT Bank and AloStar Bank of Commerce at a 1.30% APY. However, iGoBanking.com leads the way in long term CDs such as their 3 year and 5 year CD which are the highest nationally available from banks. The only other institutions that give out better long term rates are from credit unions. 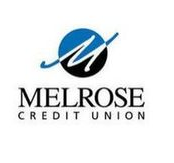 Melrose credit union is offering the 5 year CD at 2.68%, and the 3 year CD at 1.91%. Fairwinds Credit Union is also giving a 2.33% APY on a 5 year CD. iGoBanking is the online arm of Flushing Savings Bank that allows consumers to make deposits and transactions easily through their personal computer. Flushing Savings Bank has been in business since 1929 and it is an FDIC insured institution, insuring savings to the maximum of $250,000 per account. For those who are looking for places to park their money for the long term, these rates from iGoBanking are some of the highest nationally available among banks. Managing your accounts are also made easy since everything is done online. Bank of America dropped some of its certificate of deposits this past week to follow a trend of cutting rates. Bank of America, out of Charlotte, N.C cut its rates on the following CDs. 5 Year CD dropped by 0.50% to 1.75% from an average of 2.25%. 4 Year CD rates dropped from 1.75% to an average of 1.45%. 3 Year CD rates dropped to an average of 1.1% from 1.5%. The falling rates not only on CDs but also on money-market rates are leaving people with fewer places to stash cash and actually make a decent return. Money Market rates have dropped to 0.75% nationally, not making it more attractive to investors. Nationally CD Rates are at all time lows with bank institutions. Credit Unions are popping to the top of the charts, offering the highest CD rates for just about any term. When the Nation’s largest bank lowers their long term CD rates, this could signal that other banks will follow in their footsteps. Now might be the best time to get into a long term CD with a decent rate, before other banks follow the coming trend. Large banks can offer lower rates because they have other products that can grab the attention of new customers, such as many different types of checking account promotions. For the average person looking to stash their cash for a short amount of time, the options are limited. Cal Brown, vice president of planning at the Monitor Group in McClean, VA is advising clients to put their extra cash into short term bond funds. Bonds are currently yielding more than 3%, much higher than some of the highest CD rates.